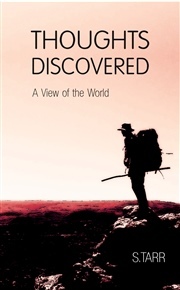 Thoughts Discovered is a varied collection of the poetic writings of S.Tarr, released in five volumes, on such relevant subjects as love and adventure, wisdom and worldview, and contemplating the wonder of life and the grandeur of things that transcend the now and the present. Wisdom for This Age is the second volume in the series. "We can be given all the riches of the world, the beauty of the ages, the wisdom of the gods, but if we do not accept this gift thoughtfully, and take it with grateful intention, then we will go on living a life that leads us nowhere and ends without adding anything worth mentioning to the great story of life that is being told." "Greatness is achieved, not only, by doing great things, but also, by making the small things we do great." "You were made for a time such as this. You were born for greater things to exist. Do not let shortsightedness make your way crooked and bent. Use your time wisely, live with vision and intent. Do not waste life's gift and live in listless rest. For you have what it takes to reach the very best. Do not let routine's weariness make you lumber and crawl. You have what it takes to stand up when you fall. Without you in this world life would be greatly amiss. You were made for a time such as this." "Anything we do, now, might lead to something great, later." "Writer of words, author of stories. Dreamer of worlds, revealer of glories." S.Tarr is a writer. He writes very short stories, also known as poems, and longer stories, also known as novels, and sometimes dabbles around in the middle and just writes short stories. During the day he writes code for websites as a web-programmer and at night he composes electronic music under the virtual band The X-Structure, and more recently Soultrek. His first series of poetic books, called Thoughts Discovered, is currently in the making, with the first volume of the series published in October 2013. Thoughts Discovered is a collection of his poetic writings on everyday observations, mystical musings and reflections on the wonder of life. Above all he is an adventurer, explorer and believer, in mind, in spirit and at heart.